Deepanjana Pal – Page 37 – she writes and she rants. This review was first published in Caravan. In an age when Photoshop has become a commonly used verb, the idea of a photograph documenting reality is almost quaint. It seems photography is all about manipulation, whether it’s at the early stages of framing a photograph or later when it’s adjusted, or photoshopped, on a computer. In case if Docu Tour, curated by Bose Krishnamachari, presently on display at Gallery BMB in Mumbai, there’s an additional layer of adjustment. According to the gallery handout, the exhibition “seeks to explore various formal strategies that are employed to transform the photo document into an artwork.” This time, instead of the subject, it is the photograph itself that is being manipulated so that it belongs in a gallery. As documentation, these photographs belong in newspapers, catalogues and photo albums. Instead, they are in the white cube of the gallery, fashioned into art. The four photographers who have contributed to Docu Tour have little in common. Although Vivek Vilasini and Gauri Gill’s photographs are shot in black and white, Vilasini’s are large-format photographs and the contrast is cranked up to make the darker tones more emphatic. Gill’s, on the other hand, are smaller and look as though they’ve been bleached. Anup Mathew Thomas’ two sets of photographs appear in Docu Tour, one a colour series based in Kerala and the other a collection of almost candid photographs of his family. Shankar Natarajan’s work in the show is a large installation, made up of photographs he’s taken since 2006. Vilasini’s three photographs are the first works the viewer sees upon entering the gallery. Their size makes them seem like windows looking out at the city. For those familiar with Vilasini’s style, the gentle humour and ironic tone will be familiar. A headless figure clutches the Constitution in ‘Unconstitutional.’ ‘Do Not Urinate Here’ shows the familiar site of a wall with religious symbols painted upon it as deterrents to desperate bladders. But Islam’s star and crescent moon, the Christian crucifix and the Hindu Om are in a crowd of stains and garbage, relegated to being part of the ugly clutter of modern India. In ‘Gandhi Street,’ a kitschy statue of the father of the nation stands in front of a building’s gates. He looks like he is about to leave the building (like Elvis, perhaps) but is rooted to his spot because the statue has no feet. It’s as though the cement has sucked him in so that all he can do is stand in an abandoned street, unable to escape this world that has turned him into a caricature of himself. Whereas Gill, Thomas and Natarajan benefit from their works being displayed in close proximity to each other, Vilasini’s photographs seem out of synch with the rest of them, which is perhaps fitting because the tone of his photographs is very different. The humour in Vilasini’s photographs contrasts sharply with the melancholy in Gill and Thomas’ works in particular. Shankar Natarajan’s ‘Photographs’ is a misfit, too, but for a different reason. There’s no ground to doubt the artistic merit of ‘Photographs’ as an installation, and it is an interesting and sophisticated piece, but the curator’s decision to include this work in a photography show is debatable. The pictures are the product of commercial assignments. They are not examples of fine art photography but simply of photographing fine art. 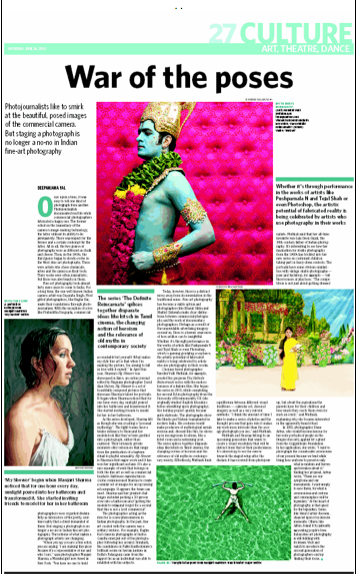 Natarajan, who dabbled in painting and art criticism, has been photographing artworks for Mumbai galleries since 2006. One of Natarajan’s central concerns is with the issue that spurred Marcel Duchamp to turn a urinal upside down in 1917: non-art. His photographs, which were originally intended to be publicity images and were, therefore, non-art, become art just because they are brought to a gallery. Across six feet, Natarajan’s photographs are arranged in a geometric grid so that a band of images runs across the wall, like a giant contact sheet. ‘Photographs’ requires you to step up to the wall and see the images up close. Natarajan has shot works by almost every important Indian contemporary artist, including Anita Dube, Bharti Kher and TV Santhosh, and no image is repeated in the installation. Considering that it is made up of images taken to make a work look most saleable, the commercialism of the art world is an obvious aspect to ‘Photographs.’ However, it is also a timely reminder of the variety of work that has been produced in so short a time. So far as Docu Tour’s announced intention of showcasing work that shows “the use of photographic documentation in the critique of socio-political structures” is concerned, the series by Gill and Thomas fit the bill perfectly. In a clever arrangement, the two artists are shown on either side of the corridor. Gill’s black and whites face Thomas’ vibrantly colourful photographs. In Gill’s work, the dry, dusty bleakness of rural Rajasthan comes across as all the more stark thanks to monochrome. Thomas, on the other hand, uses the distraction of colour cleverly. His photographs show the cheerful palette of a children’s book, only to draw the viewer closer and show them the melancholia of the people who live amidst that beautiful scenery. The effect of these two very different styles facing each other is dramatic, like walking into a bipolar mind. The juxtapositions are sometimes disturbing, like when Gill’s photograph of a boy with a plastic bag over his head—eerily reminiscent of Abu Ghraib detainees—faces Thomas’ shot of a beaming politician and his wax replica standing against lush greenery. Thomas has been photographing Kerala for years now and Docu Tour includes images from his most recent series, View from Conolly’s Plot, as well as an older set from 2003, titled Well, Basically This is About Thomas Jacob, which chronicled nine months in Thomas’ father’s life. Thomas describes his father as a man who lives in Kottayam and works for a newspaper, gliding past the fact that his father is the editorial director of Malayala Manorama, one of the most widely circulated publications in the country. Although having 500 images in Well, Basically This is About Thomas Jacob is selfindulgent, the two-channel slideshow is an interesting look at two sides of Jacob, one when he is in Kottayam and the other when he and his wife visit their son (Thomas’ brother) in England. In Kottayam, Jacob is a figure of authority while in England, the same person seems almost helpless and reduced to being simply an old man in England. The photographs from View From Conolly’s Plot are far stronger. Contained in his photographs are references to Kerala’s attempts to create a bridge between its past and its present, starting from the legacy of Henry Valentine Conolly, the Briton who set up the world’s first teak plantation in Kerala. Saint George’s Forane church turned from church to graveyard when its congregation outgrew it and moved to new premises. The collapse of the joint family system can be seen in the striking ‘House on the Roadside’ in which a home is physically cut in two. Gill’s photographs, a selection from her Notes from the Desert, are the strongest in terms of narrative in Docu Tour. She began shooting in rural Rajasthan in 1999, originally with the intention of putting together a photo essay about rural education. As the subjects of her photographs invited her into their lives, the project spiralled out of control and over the next 11 years, Gill has collected thousands of images that chronicle the lives of the marginalised and the impoverished of Barmer. As a social documentary project, Notes from the Desert is remarkable and poignant. Without becoming oppressively grim, Gill presents a work that looks at the present mismanagement in the Rajasthani village. Her photographs also reference past traditions of imagemaking, subtly critiquing the practice of objectifying the poor as well as celebrating simple but relevant stereotypes like a mother’s love for her child. As photographs, they are beautifully composed and silvered with melancholia. They are intimate but Gill doesn’t ever try to create an illusion of being within the world being photographed, which is a smart aesthetic decision since to most viewers this unromanticised Rajasthan is an unfamiliar world. The viewer is always an outsider, but a welcome one. Sometimes, the outsider glimpses private moments, like Ismat at her daughter Janat’s grave, but a certain distance between the camera and the subject is carefully maintained. With all the hue and cry that is made about the ability of photographs to manipulate reality and the glut of mindless visuals in contemporary media, perhaps it is worth remembering that photography has been an important truth-teller in the 20th century because of the space that was given to social documentation. Galleries like Gallery BMB, Photoink and Nature Morte must be applauded for providing a showcase for this genre of photography, but that such photographs need to be ‘transformed’ into fine art is far from heartening.